Walnut Hollow is the source for the best fine wood surfaces, tools and accessories for crafter and hobbyists. I recently created this illuminated address plaque using their bark-edged Basswood Country Round. Follow the picture how-to so you can make one for your home too. Now your guests won't miss out on sipping spiced rum around the fireplace when they see your house number lit up in the dark forest. Oh I wish I had a cabin in the woods! Position and center the battery pack of the LED lights on the bottom edge of the backside of basswood round. With a pencil, trace around the battery pack. Make a chisel guide, slightly bigger than the tracing, using a utility knife and ruler. Clamp basswood round to work surface. 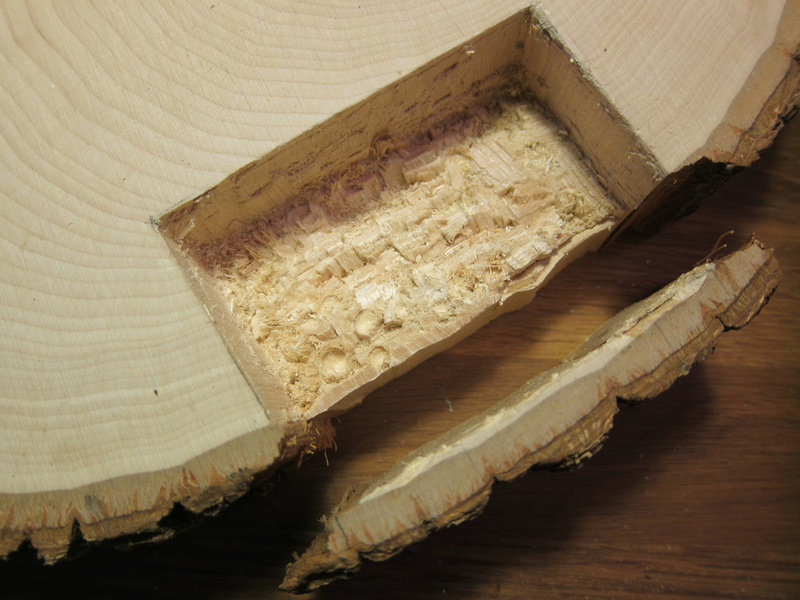 With a wood chisel and hammer, carefully chisel off the bark edge of basswood next to the tracing marks. Put the bark piece aside. Chisel out the marked space, deep enough so the battery pack sits flush inside the basswood round. Clean surfaces by removing all dust and wood shavings. Use a wood glue to affix the bark edge back to the basswood round. Rubber-bands will help hold the piece in place as it dries. Sand front of basswood round with a fine grit sand paper. Create a number stencil. Pick a font and print out numbers to a piece of paper in the appropriate size. Cut numbers out with utility knife on a cutting mat. Save all number elements (i.e. inside circle of number 6). Position and center stencil to front of basswood round. Secure with tape. With paint and a foam pouncer, stencil the number. Remove paper stencil and let dry. With the numbers that were cut from stencil, evenly mark 20 light holes. Tape paper numbers over painted numbers on basswood. With a drill affixed with an 11/64" bit, drill through basswood round on marks. Clean off any wood dust and reapply number stencil. Touch up paint in and around drill holes. Let dry. Seal wood with a wood sealer. Sand in between coats. Flip Basswood round over. Place battery pack into place. Insert a light into each drill hole. Secure in place with tape. Cut a piece of chipboard to fit the back of basswood round. Cut out a hole where battery pack is. With wire brad nails and a hammer, secure the clip board to the basswood. Cut a craft stick in half and nail to basswood above battery pack. It should hold pack in place, but pivot to remove pack for battery replacement. Add hanging hardware to back.